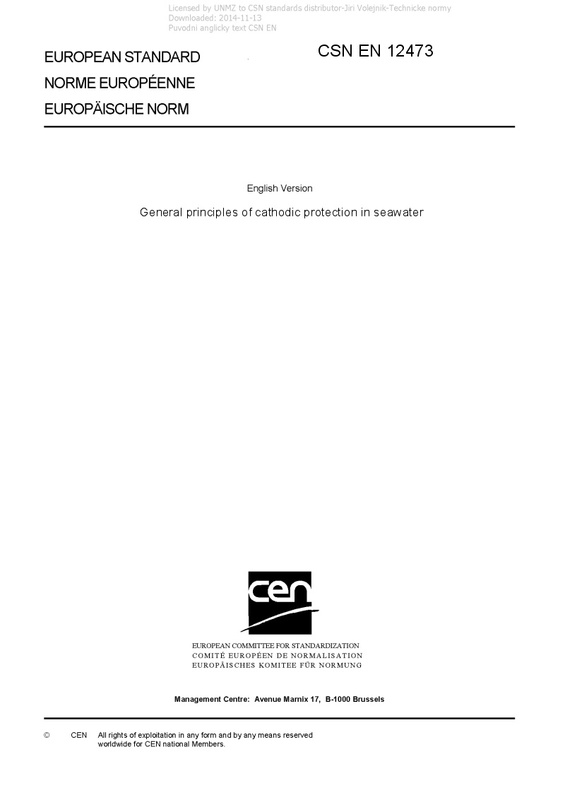 EN 12473 General principles of cathodic protection in seawater - This European Standard covers the general principles of cathodic protection when applied in seawater, brackish waters and marine mud. It is intended to be an introduction, to provide a link between the theoretical aspects and the practical applications, and to constitute a support to the other European Standards devoted to cathodic protection of steel structures in seawater. This European Standard specifies the criteria required for cathodic protection. It provides recommendations and information on reference electrodes, design considerations and prevention of the secondary effects of cathodic protection. The practical applications of cathodic protection in seawater are covered by the following standards: - EN 12495, Cathodic protection for fixed steel offshore structures; - EN ISO 13174, Cathodic protection of harbour installations (ISO 13174); - EN 12496, Galvanic anodes for cathodic protection in seawater and saline mud; - EN 13173, Cathodic protection for steel offshore floating structures; - EN 16222, Cathodic protection of ship hulls; - EN 12474, Cathodic protection of submarine pipelines; - ISO 15589 2, Petroleum, petrochemical and natural gas industries - Cathodic protection of pipeline transportation systems - Part 2: Offshore pipelines. For cathodic protection of steel reinforced concrete whether exposed to seawater or to the atmosphere, EN ISO 12696 applies.